Why don't management's optimistic comments line up with the market's current distain for this solar stock? 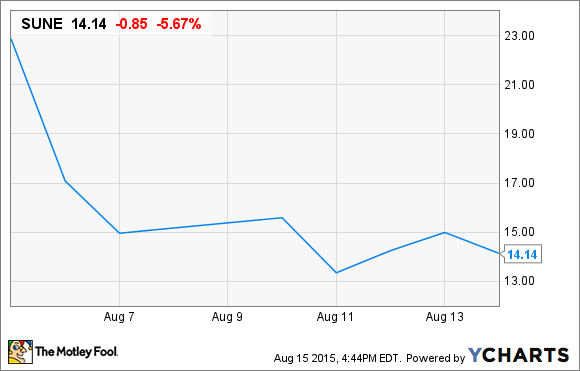 The market hasn't been kind to SunEdison Inc (NASDAQOTH:SUNEQ) since the company reported earnings on August 6. Shares are down 38% since then and there seems to be a loss of confidence in the company's growth plans. Looking through the company's conference call, here are the comments from management that stuck out to me. Today, SunEdison is all about growth and this comment shows that. The company has been on an acquisition spree, buying up developers and assets that can be used to grow its yieldco and cash available for distribution from that yieldco. SunEdison's biggest acquisitions have been wind and residential solar businesses and now that it has those under its wing it can compete in almost any renewable energy space. That's been management's goal in expanding and now it has to show that the synergies it says exist actually do. Here's where the market is a little uncertain. If you listen to management, there are lots of ways being the biggest renewable energy developer in the world makes SunEdison a stronger company. But continued losses tell a different story and investors don't know which one is true or if the acquisitions will pay off long-term. The move to acquire Vivint Solar was a questionable one on a lot of levels. First of all, the Vivint Solar culture of door to door sales and high pressure tactics that they're known for don't necessarily mix with SunEdison's usual utility customers. Then there's the focus on expanding the business internationally with TerraForm Global, which may or may not have synergies with the other parts of the business. The market's tepid response to TerraForm Global -- which initially planned to sell shares at $19 to $21 per share and eventually IPOed for $15 and currently trades at $10.56 -- may show that investors aren't quite certain if SunEdison can deliver the returns it has promised with the global yieldco. Here's where SunEdison becomes a dizzying array of complex financial instruments. The company introduced the "warehouse facility" to house newly acquired assets that it didn't have the funds to buy outright. In the facility there's an equity partner that's guaranteed a rate of return and also debt, which comes with a high rate of interest. SunEdison raised $2 billion of these warehouse facilities and plans to use them to expand over the next few years. That could be a boon for shareholders if interest rates stay low but if they rise, as many predict, variable interest rates on debt could eat up most of SunEdison's upside from these facilities and it's unknown what the company would do with the assets then. As I've noted above, SunEdison has a lot of projects under construction and those projects will need a lot of cash to be completed. But the company has prepared for that with $1 billion in cash on the balance sheet. What investors should watch over the next year is how cash flows through the business and how interest rates trend. Recently announced rates, like the one for its warehouse facility, have been relatively high for a solar company, which could make SunEdison less competitive on projects long-term. Is the sun rising or setting on SunEdison? This is a high growth company but it's lost its place as a market darling in recent months, which should be concerning. What management didn't talk much about on the conference call was the company's continued losses, including $263 million last quarter alone. That's what has investors concerned because if you can't grow profitably what's the point of growing? I have more questions than answers about SunEdison and until we see consistent profits and cash flows I see this as a high-risk solar investment. The last month has shown just how fast the market can sour on this solar stock so buyer beware.